The Virginia Museum of History & Culture currently offers two teachers institutes along with teacher workshops. Exceptionally well-planned, executed institute that provides a history teacher with superb tools, regardless of the subject he/she teaches. My enhanced knowledge of archaeology, anthropology, ethnology, and linguistics will definitely benefit me in my World History classroom. The Weinstein Properties Story of Virginia Teachers Institute is a week-long program that is offered twice each summer at the Virginia Museum of History & Culture. Open to all Virginia public and private school K-12 educators, this institute provides teachers with an overview of the rich history of Virginia from the earliest habitation to the present. 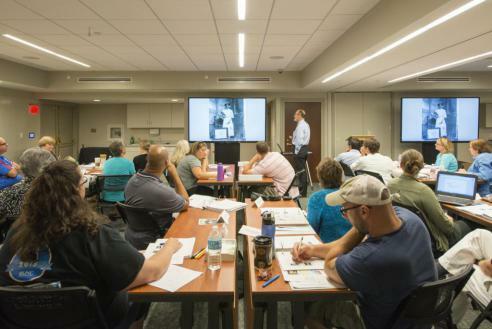 Participating teachers will explore the vast collections of the Virginia Museum of History & Culture and learn how to teach their students to analyze primary sources and use historical thinking skills. Save the date for the Summer 2019 Weinstein Properties Story of Virginia Teachers Institutes! Session 1: July 15 – July 19, 2019. Register here. While this session of the institute will provide teachers with an overview of Virginia history from the earliest habitation to the present, its primary focus will be on African-American history in the commonwealth, as viewed through the lens of the museum’s newest exhibition, Determined: The 400-Year Struggle for Black Equality. Participating teachers will learn methods and best practices for teaching hard history while exploring the vast collections of the Virginia Museum of History and Culture. Session 2: July 29 – August 2, 2019. Register here. This session of the institute will provide teachers with an overview of the rich history of Virginia from the earliest habitation to the present. In addition, participating teachers will explore the vast collections of the Virginia Museum of History and Culture and learn how to teach their students to analyze primary sources and use historical thinking skills. For more information, contact Michael Plumb at 804.342.9642 or mplumb@VirginiaHistory.org. Primarily Virginia is an online course designed for teachers to explore Virginia’s past by examining objects and primary sources. These pieces of the past will be used as a lens to examine different historical eras in Virginia history. All course work is to be completed through the course website, and there are no required in-person class meetings. The course is offered three times a year and is free of charge to Virginia teachers, thanks to the generous support of the WestRock Foundation. For additional information, please contact Hailey Fenner, 804.342.9689, hhouse@VirginiaHistory.org. These programs are designed to strengthen the analytical abilities of middle and high school teachers. Teachers will learn historical thinking skills—sourcing, contextualization, corroboration, and close reading—by using letters, diaries, documents, photographs, and maps from the society’s collections. These workshops can be conducted at the Virginia Museum of History & Culture or in your school and are perfect for in-service teacher training. Are you interested in a virtual field trip? The Virginia Museum of History & Culture offers interactive distance learning content for all ages.